Today is Flag Day in the United States of America. Flags are enduring symbols that mark territory, reinforce statehood, and show solidarity with those who fly the same flag. However, a symbol that unifies one group creates an ‘other’ — even within one's national borders. Since September 11, 2001, flying the U.S. Flag is defacto support for an increasingly extreme Republican Party. In Steven Spielberg’s recent commencement address at Harvard, he challenged all to unify the ‘us’ and the ‘them’ into a ‘we’. Is there a flag that can be flown on Flag Day that would promote this belief. A flag could be designed to be a symbol of solidarity that crosses borders to promote the ideals of life, liberty and the pursuit of happiness for all -- a flag that broadens the work of the peace flag and the gay rights flag. The Design Office is soliciting a unifying symbol to remind people everywhere that we share a planet and a common human experience. As designers, we see how products and experiences have been reduced from common to individual. Technology has reduced the drive-in movie theater to the Oculus Rift. One must make an extra effort to relate to others, to understand one another, to share an experience. Why fly a physical flag when you can generate your own personalized digital one that marks your current location? Flags are generally not the domain of graphic designers. National flags favor the overly abstract, while cities tend to be a mishmash of amateur clip art forms. Journalist Roman Mars gave an audio visual tour through the state of flag design a few years back. Flags, like all design artifacts, tend to derive their form from the production technologies available. Given improvements in printing, continuous tone images (gradients! photos!) could find their way to the flag. The idea of a dynamic data-driven flag does not seem out of the question, either. Imagine a flag that tracks rising tide waters, human population or other common concerns. Flags are material objects. And perhaps one way to arrive at a universal flag is to adapt existing ones. Donald Lipski’s manipulations at the Fabric Workshop in 1991 are one such example of playful adaption with political intent. The predictable collection of stars and bars can lead to new meanings when altered. 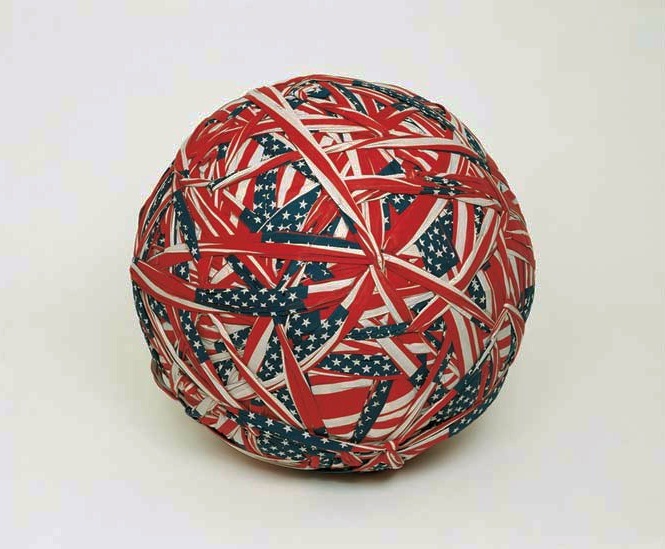 “Flag Ball,” 1991. Donald Lipski. Image provided by the artist. So we ask you to take an hour or more on this Flag Day to compose a design that everyone would feel proud waving. Designs should use a 2:1 ratio and can be uploaded to Google Drive or hashtagged #commonflag2016 on Twitter. We hope to tease out a conversation worth having, and perhaps a design that we could help to distribute. Organized by John Caserta, with participation from the DO membership and designers everywhere. Animated flag at top of post by Catherine Schmidt. Designs should use a 2:1 ratio and can be uploaded to Google Drive or hashtagged #commonflag2016 on Twitter. Our aim is to have a collection of forms with one that can be distributed. Rights remain with designer.